12 years ago, Viv and I hiked Diamondhead in about 20 minutes all the way from the park entrance (we were too cheap to pay for the $5.00 parking). Fast forward to the present and I was up for the challenge, but Viv, having not played hockey for the last 5 years due to concussions, didn't find it as easy this time around. In fact, while we were going down from the top, my son was kicking my arse. Yes, it might've been something to do with age, but I would like to blame the 2 Malasadas I consumed just prior. 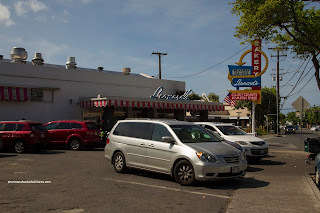 Yes, you guessed it, we paid Leonard's Bakery a visit before we made it out to Diamondhead. Once again, we were doing the touristy thing, yet remember, we had 2 hungry kiddies with us. Also, they would never pass up a donut from any culture. 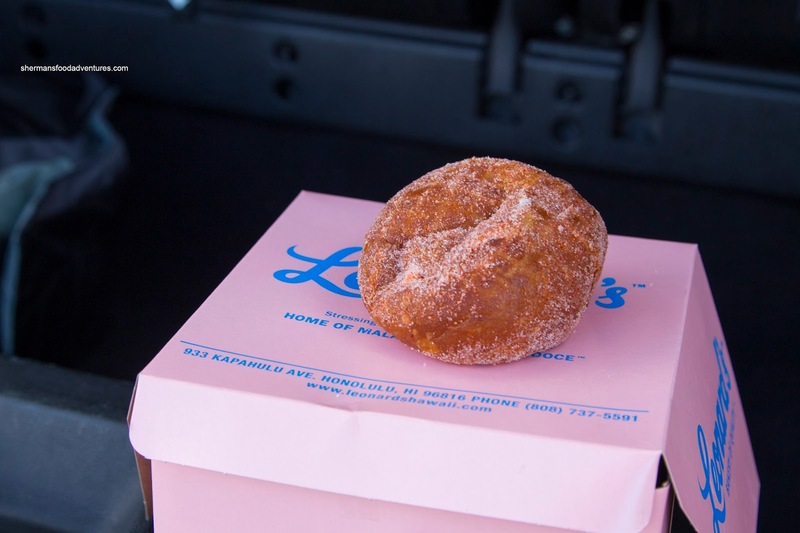 We got a 1/2 dozen Malasadas in Original, Cinnamon Sugar and Li Hing (sweet & salty dried plum dust). 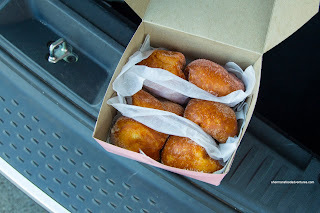 Oh boy, these were made to order and one bite into the fluffy light center made me a convert. 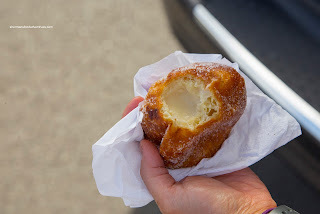 Yes, it was only a fried ball of dough, but the texture was so enticing and easy to eat. I gobbled up 2 just like that. My favorite flavor was the li hing with a good mix of sweet, tart and salty. 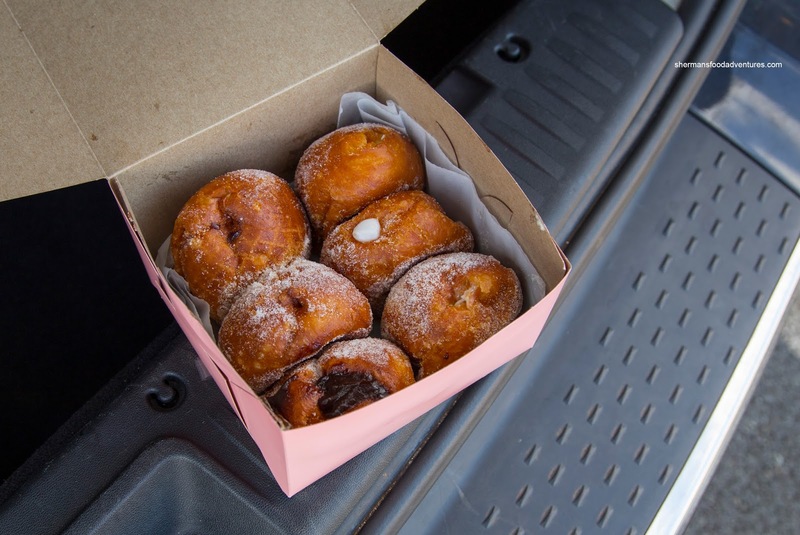 We also got a 1/2 dozen of the Puffs filled with Chocolate, Coconut, Custard and Macademia Nut. Exhibiting the same eggy light texture, these were graced with an extra amount of sweetness. In fact, the chocolate filling was very sugary, yet fortunately, the actual malasada was not sweet to begin with. I liked the coconut filling the most as it wasn't super sweet while being aromatic. Despite being advertised as macadamia nut, I didn't find much difference between that and the standard custard. Not necessarily a negative, just an observation. Lastly, we got a couple of the Ham & Cheese Wrap to give the kids something that resembled breakfast rather than a bunch of Malasadas. 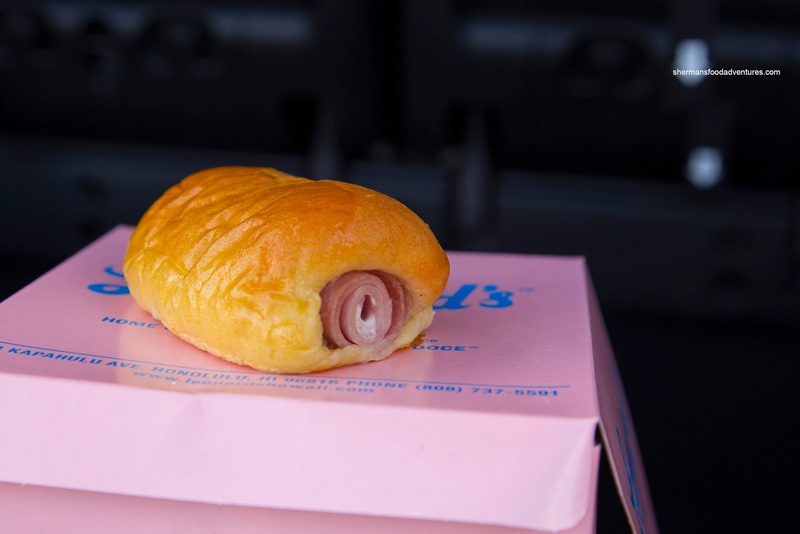 With a generous slice of rolled-up sweet honey ham in the middle, the thing ate well with plenty of filling while wrapped in a soft pastry. But really, we didn't come here for that. It was all about the malasadas and they really go that part down to a science. It was well-worth the wait for the made-to-order treat.